The Colleges of Law will carry the debate tradition forward with its own program on Oct. 26, a dialogue on capital punishment in California. They gathered for three hours to witness two men, each without the aid of artificial amplification, deliberate on the issues of the day. It was a spectacle of contrast, not just in opinion but appearance. Representing the Democrats was a man known affectionately as “Little Giant,” an apt nickname for the 5-foot-4-inch stature of incumbent Stephen A. Douglas. 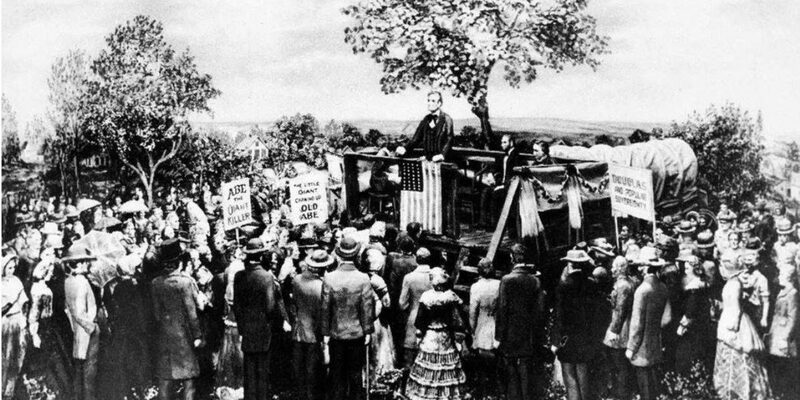 Towering over him, standing at 6-feet-4-inches, was his opponent, the “Rail-Splitter” Republican challenger for the United States Senate, Abraham Lincoln. The pair gathered at Knox College in Galesburg, Ill., for the fifth of what would be seven Lincoln-Douglas debates. All of this happened 158 years ago this month, on October 7, 1858. As history marches us through another election cycle, we once again gather to watch two challengers wage rhetorical chess as the fate of our Republic hangs in the balance (or so crow their respective advance teams). And while the quality of candidate case-making in the age of Lincoln surely soars above what we experience today (contrasting Shakespearian-caliber orations to the modern musings of professional wrestlers comes to mind), the act of competitive argumentation still draws a crowd. Viewership of the first presidential debate on September 26 exceeded a record 84 million, nearly three times the population of the United States in 1858. Another 67 million watched the second debate on October 9. The numbers confirm that people remain interested in formal debate. Sports aside, the presidential contests stand as among our most significant shared television moments. As viewership of event programming—the Oscars, mini-series such as Roots, the final episodes of popular dramas and sitcoms—wanes, these debates hold their own in the pantheon of most watched shows in television history (it helps to have compelling personalities). People like the mano a mano nature of the contest: two people before millions, stripped of script with only their wits, charm, and self-professed “facts” to see them through. We root for our combatant, hiss the other side, and for some, keep an open mind toward making up one’s mind. Such intrigue has kept us coming back to the format across the full arc of recorded history: from Cicero vs. Catiline to Martin Luther vs. Johann Eck to Gore Vidal vs. William F. Buckley, and yes Lincoln vs. Douglas. As we collectively grimace at the continued lowering of the bar in the current presidential contest (if it got any lower we would need to start digging), we can feel good that debate, that ultimate intellectual contest, still holds sway. After centuries of practice, it remains a favored format for slinging insults, leveling tirades, and mastering the art of the interruption. We at the Colleges of Law will carry on this tradition—although with the promise of heightened decorum than witnessed thus far on the presidential front—on October 26 when we proudly swing open the doors of our Santa Barbara campus (located on the corner of State and Victoria) for a debate on capital punishment in California, with particular attention devoted to ballot Propositions 62 and 66. Arguing in favor of ending the death penalty in this state will be Robert Sanger, a member of our adjunct faculty and distinguished local criminal defense attorney. Arguing against the measure will be Robert Simon, a senior deputy district attorney for Ventura County. The show starts at 6:30 p.m. All are invited. Click here to learn more. As for Lincoln and Douglas, history preserves their names in bold as the spirits to aspire. “The expectations of all parties were far surpassed in the results of Thursday,” continued Sherman in his eyewitness account of the contest. As for Lincoln, he won the popular vote, but fell short of the Senate due to Douglas’ Democrats delivering more state legislature seats (remember that the 17th Amendment—direct election of Senators—wouldn’t come along for another 55 years). Lincoln of course would make a profound comeback the following election cycle. We still talk about this footnote in history as among the most consequential moments of the 1850s, if not the entire 19th century. It’s because these two men faced the public to argue the most existential question in American history: whether our country’s mission statement of life, liberty, and the pursuit of happiness extended to all. They didn’t settle the argument—that came later—but they helped frame it, and they did so thanks to the lasting power and legacy of debate. I hope you’ll join us on the 26th.